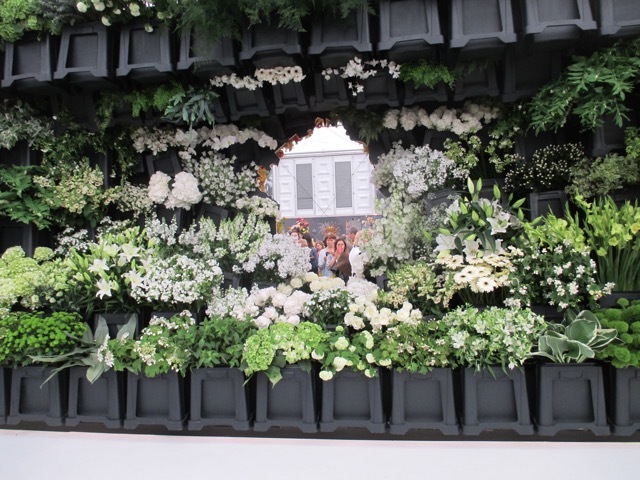 A visit to the Chelsea Flower show is probably on the bucket list of most passionate gardeners, and has been on mine for years, but work has always prevented me from attending. Not this year though, so I bought my partner tickets for Christmas - a very cunning plan, as I had to buy one for myself as well! Our show day was Thursday, and it dawned warm and sunny, and it stayed like that all day, making the weather as perfect as you imagine it will be. We headed to the Show Gardens first, and they were absolutely amazing. We were not disappointed! 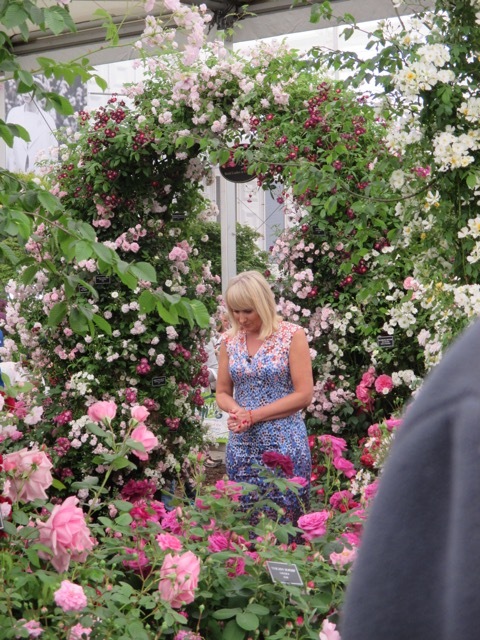 The BBC were out in force, filming, in the show gardens and it was an interesting process to watch . 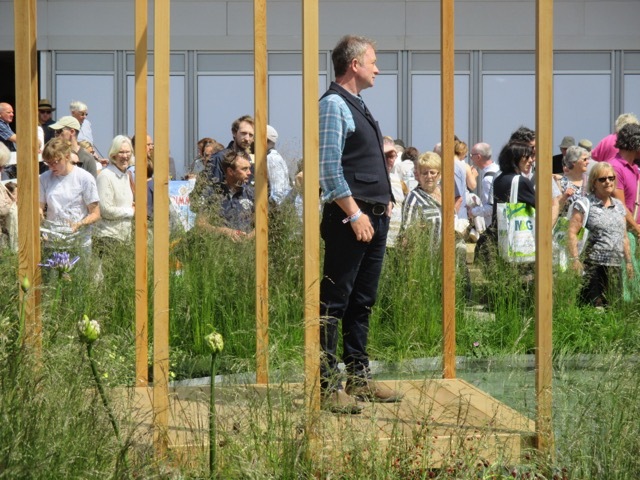 We also saw the presenters around the site too - Monty Don, Joe Sharp, Toby Buckland and Nicky Chapman. Carol Klein would have completed the set, but it was not to be ! 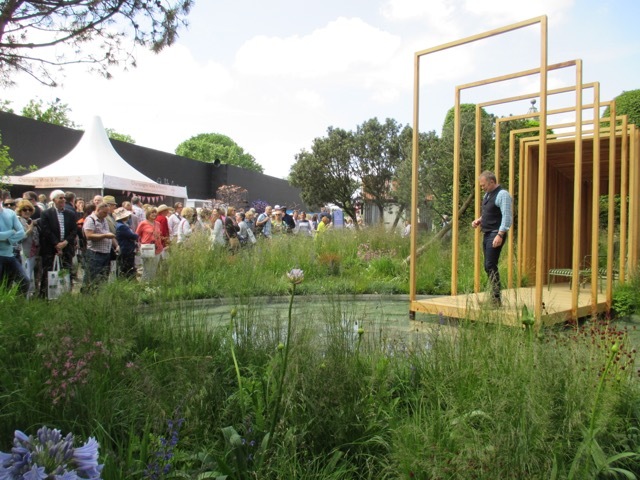 The garden designers were also much in evidence, and many were in their gardens, chatting to the public, or giving interviews. 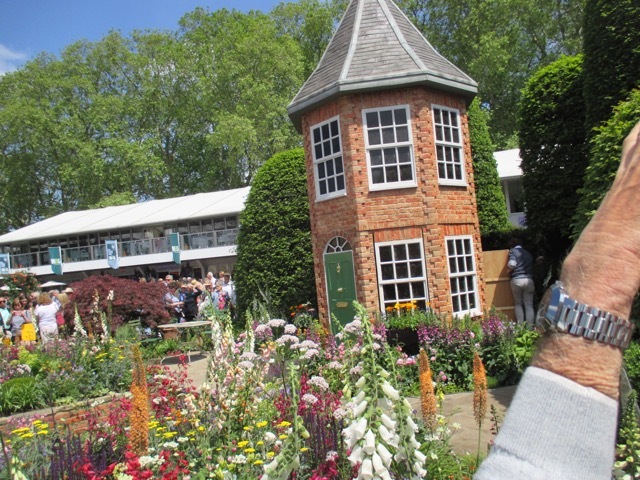 Diarmuid Gavin exited from the little gothic tower in his bonkers garden, along with many friends ! How did they all fit in? 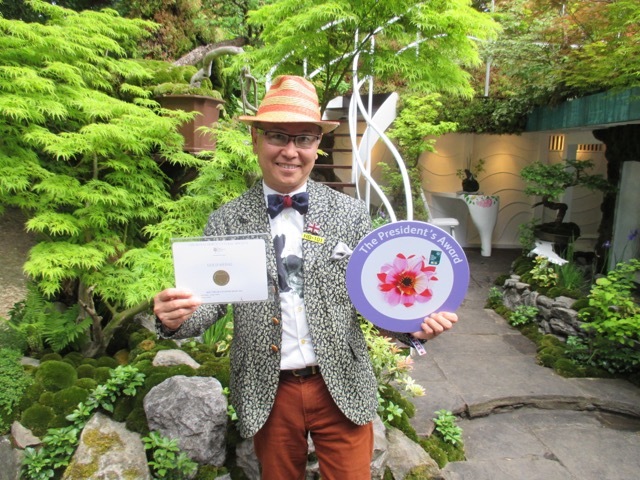 The highlights for me were the Japanese designer Kazuyuki Ishihara's garden which was suitably quirky and, although small, was perfectly formed. We happened along at just the right moment when he was showing the crowd his awards. 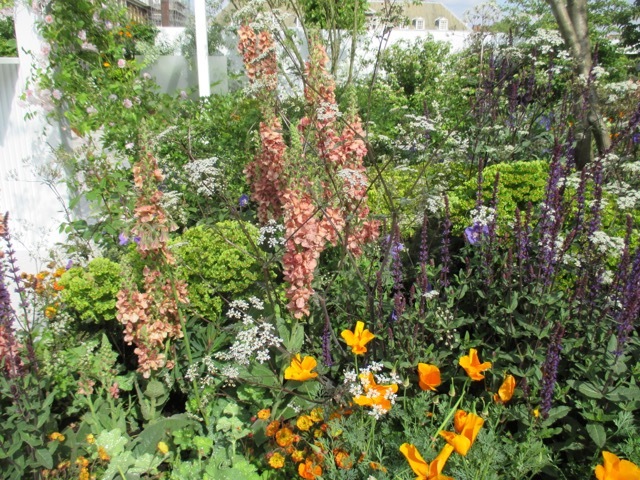 The garden pictured below was designed by Charlie Albone, sponsored by Husqvarna and was my favourite. 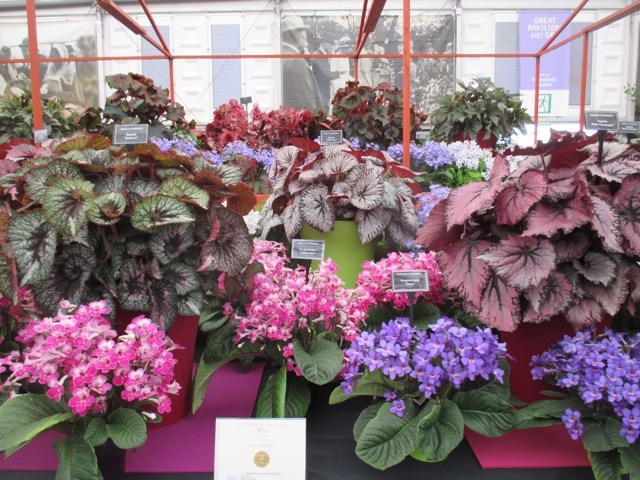 I loved the rich, dark palette of the planting, featuring lots of purples and dark pinks. Exotics such as Acacia and Protea were planted alongside more traditional european perennials and all were offset by tiered formal hedging, and flashes of white. 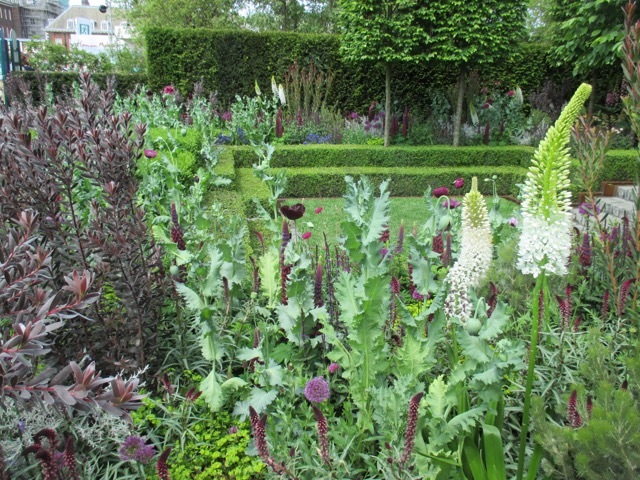 which Chelsea must create, it is good to know that this garden, at least, is here to stay. The garden above was designed by Hay Joung Hwang and sponsored by L G Electronics. 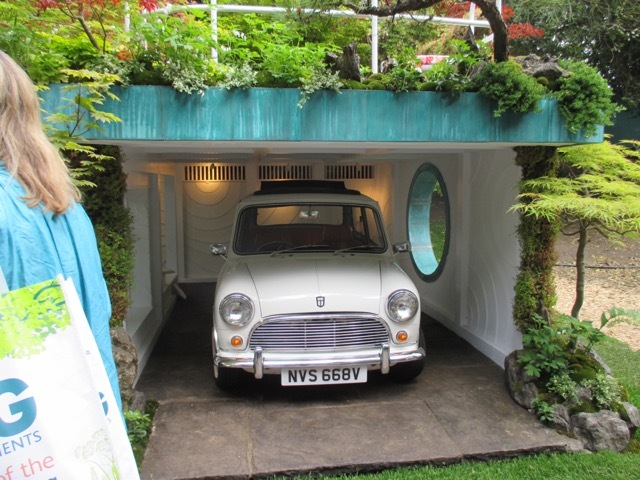 It represents a Scandinavian lifestyle garden. 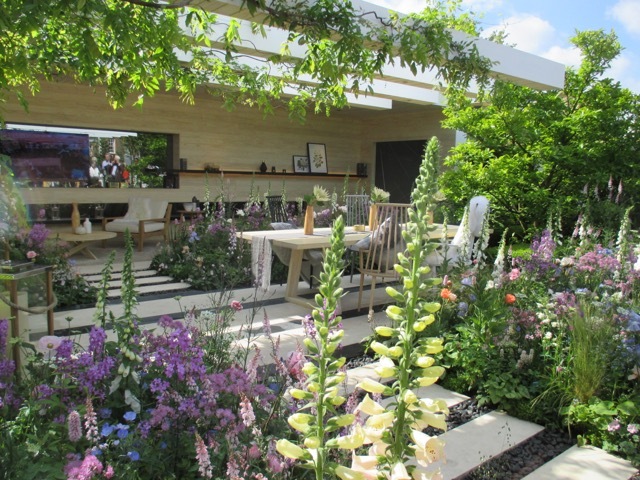 I loved the way the cool, pale hard landscaping contrasted with the dense informal planting. 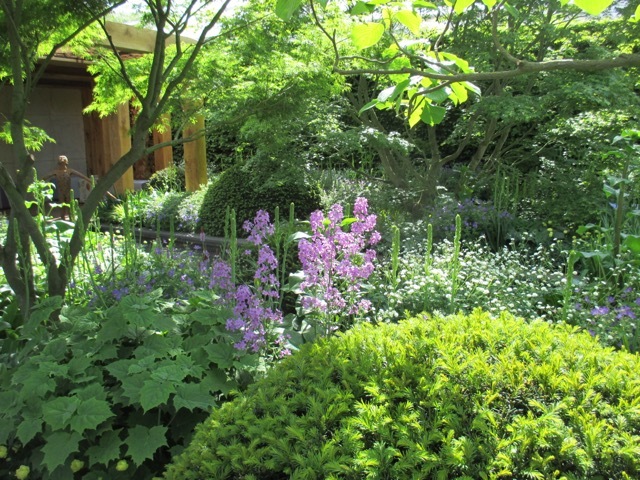 On the whole the planting was very similar in many of the gardens, and using a palette of pastel colours, it utilised cottage garden perennials, packed densely to create a rich, relaxed and informal effect. 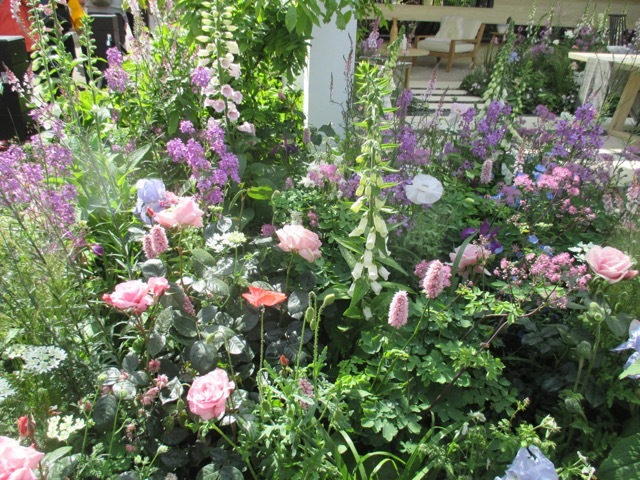 All the trusty favourites were there - roses, foxgloves,verbascum and poppies, to name but a few! 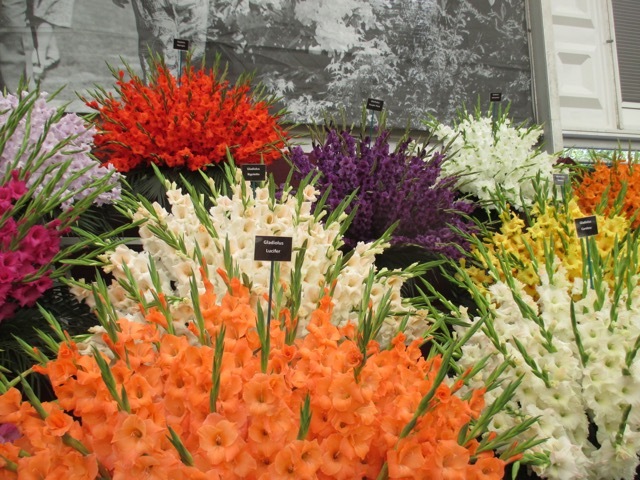 ... and the over the top exuberance of the gladioli. 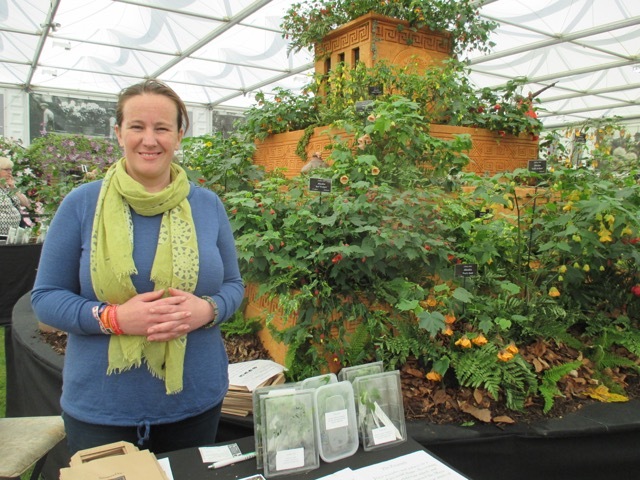 We have been to several other of the 'big' RHS shows over the years, and thoroughly enjoyed them, but Chelsea is clearly the King of them all . 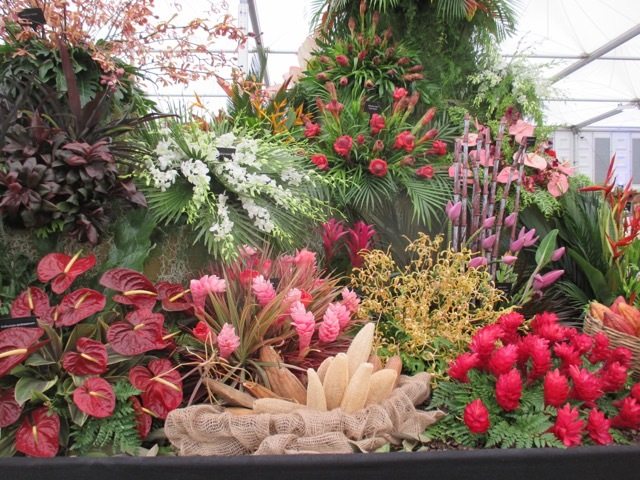 The Show Gardens are in a league of their own, and are the heart of the whole event. 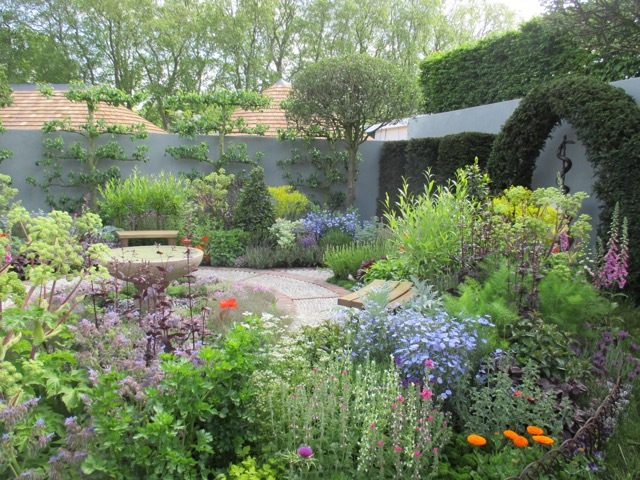 The quality of the planting and the build is fabulous, and there is so much to learn from them. 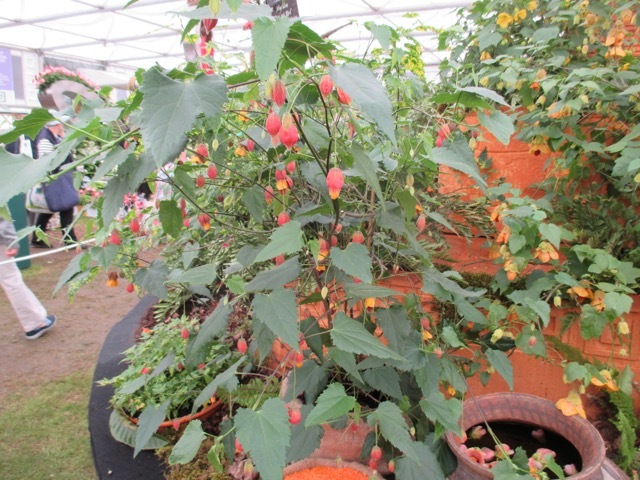 One of the highlights of Chelsea for me was one of the exhibitors, 'Wall End Nursery' featuring abutilons, with a gorgeous stand, showcasing the range of varieties and colours available. Leila Jackson and Eric Turner hold the National Collection, and are very happy to give oodles of really good advice . Now I have always loved Abutilons, and have grown them over the years, but have always assumed that they are unable to tolerate low temperatures. Not so! They are much tougher than they look, and some are tougher than others. 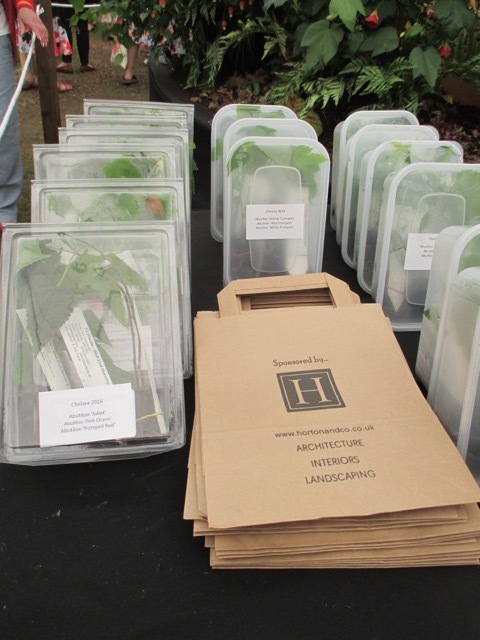 After talking with Leila, I bought 2 collections of plug plants, priced, very reasonably, at £10 for 3 plants, and she advised me which of the collection contained the most hardy varieties . I will post in more detail next time about these beautiful plants, and how they have fared. Needless to say I am excited to start growing them, and get them into the greenhouse and garden. We had a great day and Chelsea really lived up to expectations. I had envisaged it being uncomfortably crowded, but that was not the case, and in fact it was easy to move around and see the gardens. We left around 3.30 p.m. as the 'late ticket' visitors were coming in, and for a short while it was ridiculously busy. The lazy old grasses are only just beginning to stir, and the roses are weeks away from flowering, but there are some unassuming, hardworking plants out there, doing their diligent duty day after day after day. At this time of the year, there are certain stalwarts in the garden, filling it with colour, scent and foliage, and I just couldn't imagine the garden without them. 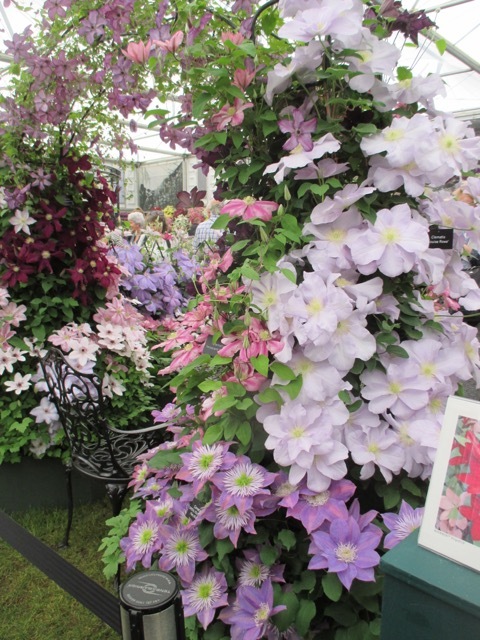 They are not the divas of the garden, and would only ever play a supporting role, but they underpin the garden structure at the moment, as we wait for the stars of the show. Erysimums - both biennial and perennial wallflowers - are giving me more pleasure than just about anything else at the moment. 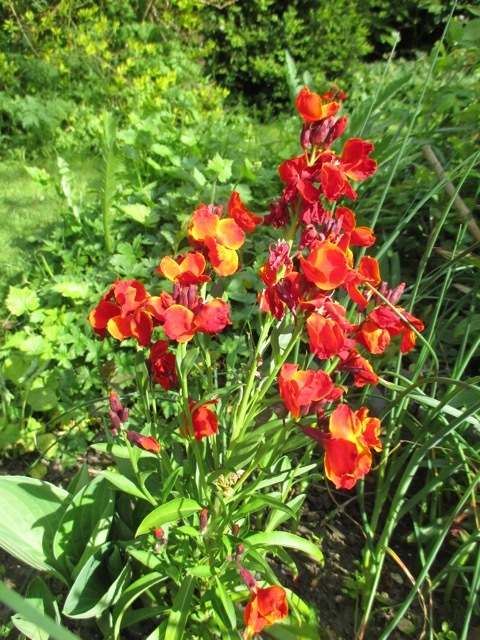 I am growing more and more every year, and trying to get diversity of flower colour, as well as scent. The ones pictured on the header of this post were sown last summer, and are biennials 'Scarlet Bedder'. 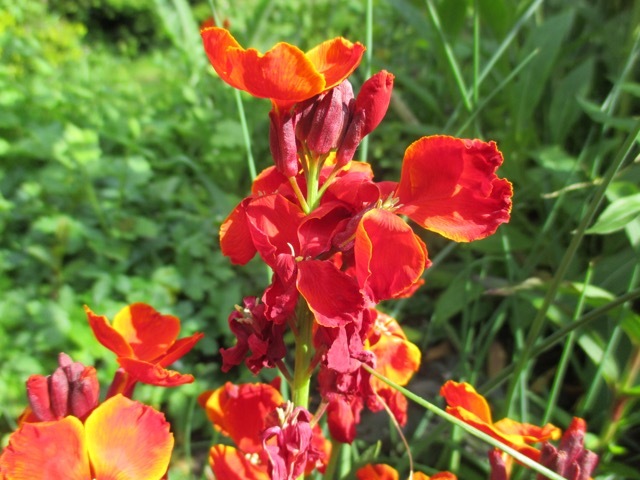 The photos do not do the true colours of the flowers justice, as the rich, fiery reds really glow in the late spring garden. 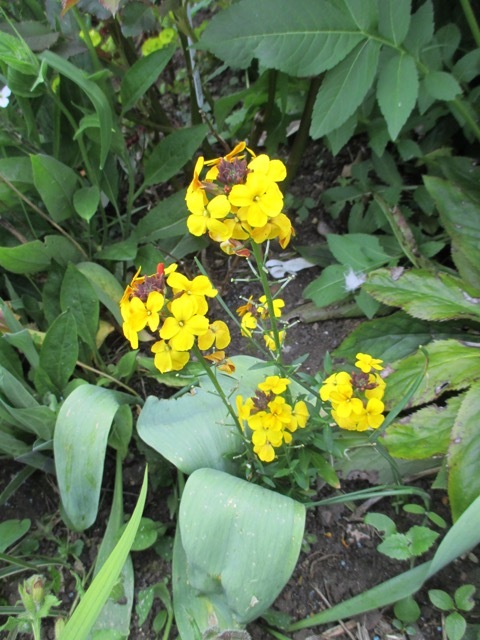 They grow to about 30 cm high, and are becoming quite bushy plants now. I grew them in the greenhouse and planted some out last autumn, then ran out of steam and time, and planted the rest in early spring. 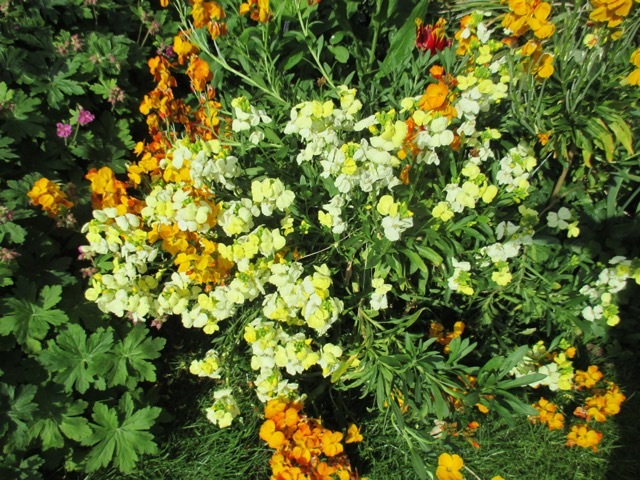 There are also some 'Persian Carpet' wall flowers, a variety which contains a mix of colours from yellow through to russets and reds. It is a variety I will be growing again. 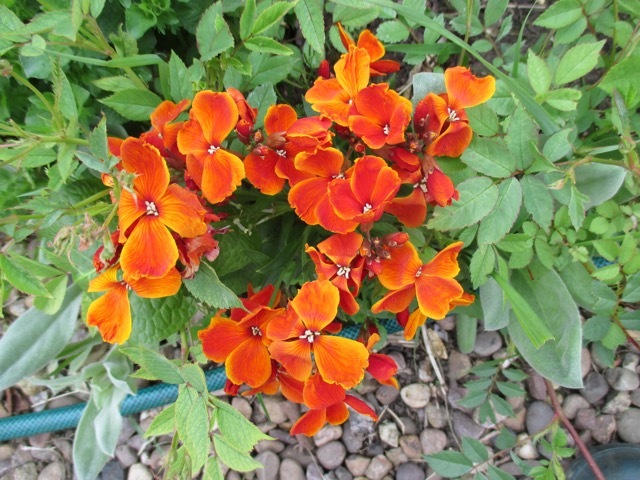 They were very easy to germinate and grow on, and are such an economical way to fill the garden with scent and colour. 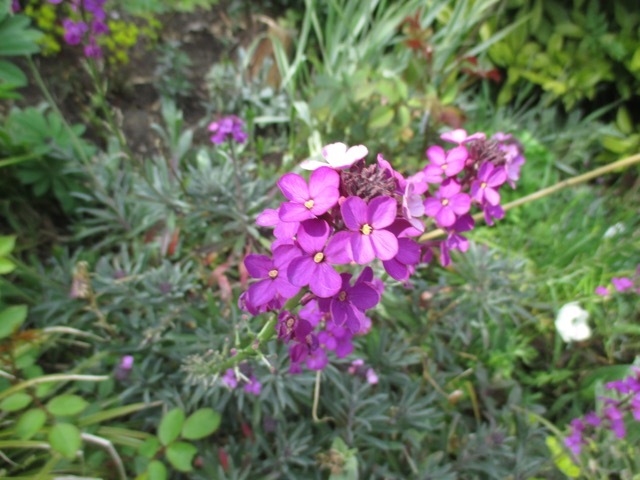 The perennial Erysimums are still an absolute joy, and there is a wide variety of colours in some young plants I bought last year. Some of the older plants are getting leggy and woody now, as they are very short lived, so I will be propagating them later in the year, to ensure continuation. Another of my favourites at this time of year are the Brunneras, and they are of interest throughout their long growing season. 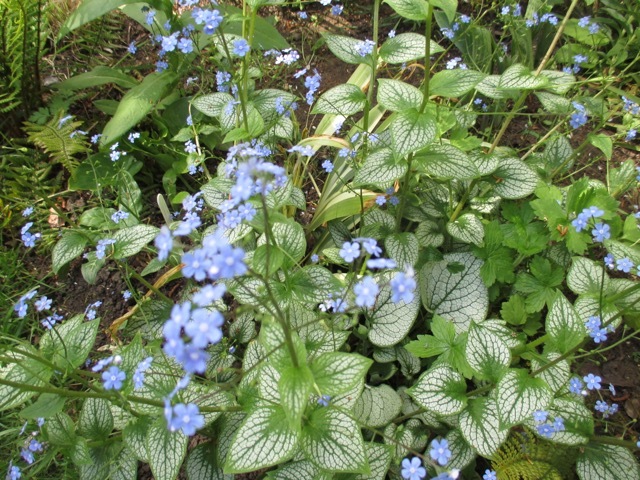 At the moment, they are still small - leaved but are wreathed in clouds of forget - me - not flowers in a clear, mid blue. As the flowers fade, the leaves begin to take over, as they grow larger and larger. I'm sure there must be lots of different - and excellent - varieties, but I tend to stick to two know and loved ones, which are 'Jack Frost' and 'Sea Heart'. 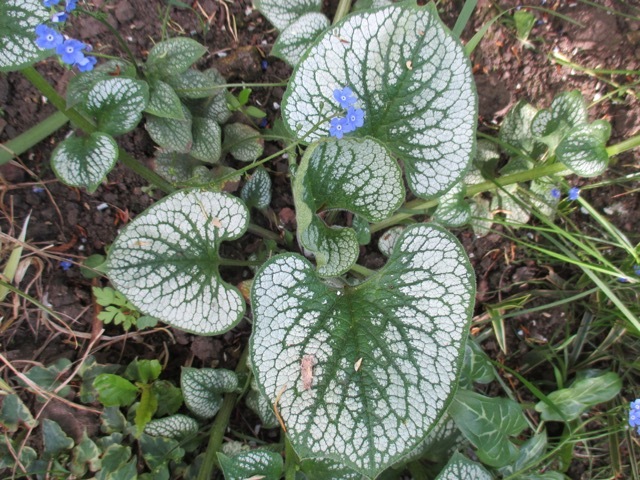 The silver variegations on both of these is superb. 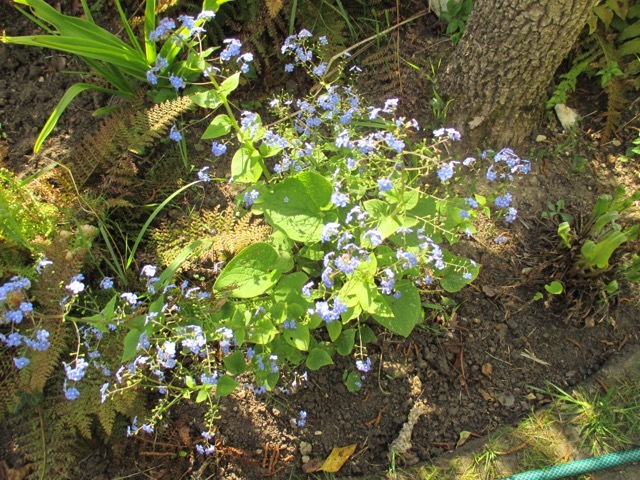 Cheap to buy, and quick to grow and bulk up, Brunneras are a superb choice. they cope with many different situations but are especially useful in deep, dry shade. 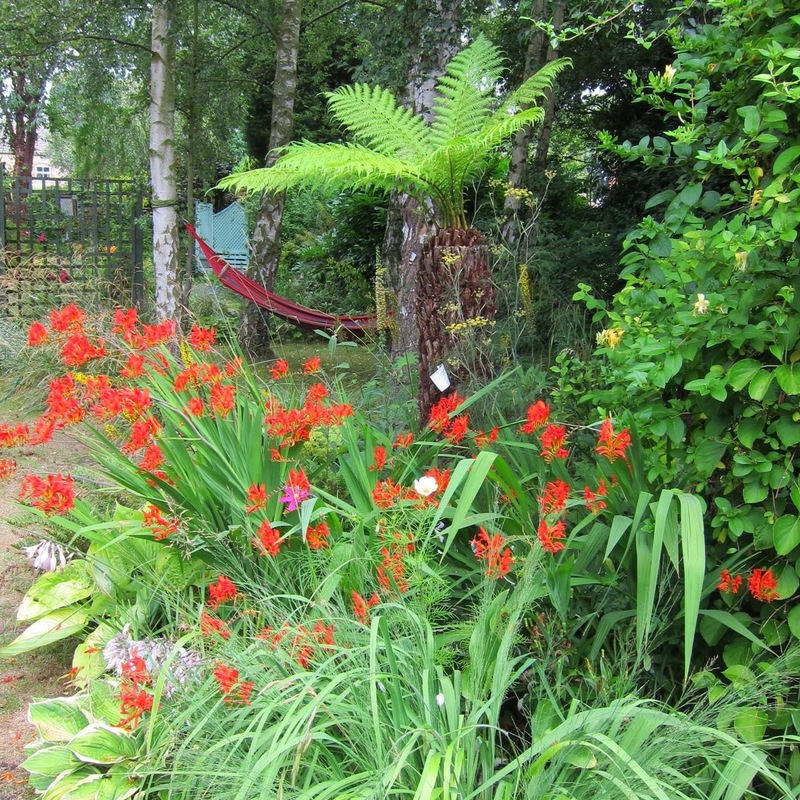 The are at home in a traditional cottage garden , or as part of a sub tropical scheme.